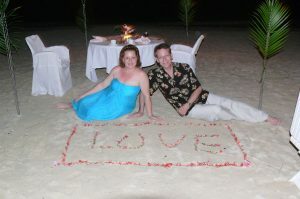 We are so glad you stopped by to visit our Newton family travel blog. Our passion is travel although we don’t get to do it as much as we would like but one day that WILL change. Most of our vacations are spent in the Caribbean, namely Jamaica. We also really enjoy our adult playtime at Walt Disney World and have dreams of traveling all over the world. I would personally love to visit every theme park all over the United States and the world. We have been to Alaska and enjoyed that experience and we are planning on visiting many other places in the U.S. and other countries as well. Greece is one country that is at the top of our list to visit. I traveled there as a teen and loved it and want Kevin to experience it too. We are thinking of taking a cruise but still undecided on that. I could go on and on about the places we dream of visiting! For those that don’t know, we won the Resort to Romance contest that Marriott had and we will be heading to St. Thomas, Virgin Islands next month. This will be our 1st time there. Kevin and I met at a Courtyard by Marriott almost 15 years ago while he was traveling for business. I’ll share that story on the blog soon but most know it from my entry into the Marriott contest. You can learn a little more about what you’ll find on the blog and where else to find us on the web on our About Us page. We look forward to sharing our Newton’s Travel with you! We would absolutely do that! Going back and forth on where to go in April. I think we are going to hold off on Greece but you never know. Welcome to the blog, Alison!